25 years ago, a young German man flew into the heart of the Soviet Union. 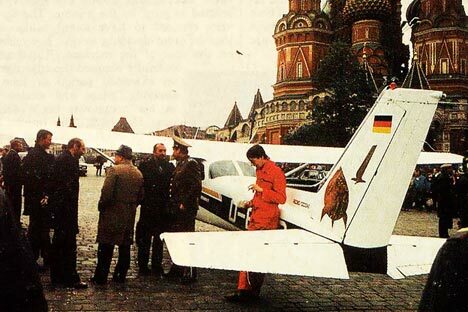 Twenty-five years ago, on the warm spring evening of May 28, 1987, as the Soviet Union celebrated Border Guard’s Day, a light single-engine Cessna-172R airplane landed gently at the very center of Moscow near Red Square. A tall man in a red jumpsuit climbed down from the cockpit, and, smiling in a friendly fashion, began signing autographs for members of the public who came running up to him. Barely 15 minutes after the landing, a police car pulled up, two men asked the pilot to get in the car, and it drove away. That same evening, the sensational news spread around the world: West German amateur pilot Mathias Rust had taken off in a rented light sport plane from an airport near Helsinki, overcome the vaunted Soviet air defense system, and flew 530 miles to land in the heart of the Soviet Union. Headlines around the world screamed: “German boy punches through the Iron Curtain.” It was a complete shock. It turned out that there were huge holes in the Soviet air defense system – holes huge enough for a small plane carrying a serious weapon such as a nuclear warhead or a bomb containing a toxic substance to get through. It became obvious that the enormous amount of money that the country spent on strengthening its security and enhancing the combat readiness of the Soviet armed forces was being spent ineffectively. This was the topic of discussion at an emergency meeting of the Politburo, where a decision was made to update the leadership of the armed forces. Three Marshals of the Soviet Union and about three hundred generals and colonels were then forced to resign. Among the victims were Sergei Sokolov, Marshal of the Soviet Union and Soviet Minister of Defense and Alexander Koldunov, Marshal of the Soviet Union and Commander of the country's air defense system. Some Western media claimed that such a large-scale purge of the senior command of the Soviet Army had not taken place since the 1937 Stalinist purges. Igor Maltsev, colonel-general and chief of staff of the air defense system, was only saved due to the fact that on the day when Rust crossed the Soviet border and landed on Red Square, he was attending a session of the Supreme Soviet of the Estonian Soviet Socialist Republic in Tallinn. Many years later, after he had retired, Maltsev said that he did not believe Karl Kortelainen, chairman of the Estonian KGB, when he said that an airplane landed on Red Square. "I did not believe him," said General Maltsev. "We went to the air defense command post near Tallinn, and listened to the operational duty officer for the intelligence center." And it turned out the information was accurate, "Rust crossed the border over the territory of Estonia." How could such a powerful air defense system have failed? "First of all,” Maltsev said, “The powerful Soviet air defense system of the time was designed to fight against massive air strikes targeted at facilities and troops on our territory, and not to fight against light aircraft. Secondly, after the incident with the Korean Boeing [when a passenger jet that violated Soviet airspace in the Far East was shot down on Sept. 1, 1983] the Soviet Union signed an Annex to the Convention on International Civil Aviation, which forbids shooting down civilian aircraft in principle, that is, regardless of where and why such an aircraft flew over the border. Following the signing of this addendum, the Soviet minister of defense signed an order banning opening fire on passenger, transport and light-engine airplanes. For some reason, no one remembered this at the time, and no one still remembers this. “The commander of the 14th Air Defense Division decided to classify the aircraft as a foreign intruder, and reports were sent to the command post of the 60th Army of the Air Defense Division in Leningrad. All forces on duty were put on priority alert. A couple of fighters took off into the air, but at 2:30 pm the target had been lost, because the continuous radar field of 100 meters only functioned in a narrow strip along the border, beyond it were dead zones, and Rust for some reason opted to fly in them. “At 3:30 pm, when the aircraft could not be detected, the commander of the 60th Army reported to Moscow that target 8255 was a dense flock of birds. Rust at the time was in the area of the Dno train station, but he was only able to be found at 6:30 pm above Khodynka field. At 6:55 pm, he landed." General Maltsev expressed doubt that Rust could have found his way across the Soviet borders and territory by himself without being detected and identified. However, there is no evidence of cooperation between the German youth and any kind of special forces or NATO. Neither an investigation nor the court that sentenced Rust to four years in prison could prove any relationship. And Rust himself, who again recently appeared on television in connection with the anniversary of his scandalous flight, denies any such connection. Many experts believe that Soviet leader Mikhail Gorbachev used Rust's flight to decisively purge the conservative leadership of the Armed Forces, who did not support his reforms aimed at strengthening democracy. And, moreover, these experts argue that this moment marked the beginning of the collapse of the Soviet Armed Forces and the degradation of the country itself. But it seems that both of these assumptions are exaggerated. The generals and marshals who replaced the Sokolov and Koldunov were cut from the same cloth as their predecessors. And the degradation of the Soviet Union and its army began long before Rust flew in, and for entirely different reasons.